Social media streams are crowded, fast-flowing and very very competitive. As social networks pull back on organic reach, showing up is hard and getting attention is even harder. So how can you stand out on social? Marketers that go big are doing better. And the one way to go bigger than anyone else is to upgrade your content to maximum power. That’s social media video. Social media videos are so engaging that the networks are pushing them way to the top of social streams. Facebook, Instagram and LinkedIn all want us to do more in this all-powerful format. It wins in the algorithms and in wins for attention. As a social media marketer, video is your most powerful tool. So rather than just post a headline and link to your article, make a tiny commercial of you introducing your article to your followers. Here’s how to make social media videos that slow the scroll and capture clicks. A shakey cell phone video isn’t what we’re going for here. That’s what everyone does. Your laptop has a camera and mic, but you can do better than that. A little more effort will get you much better results. So here’s my process for leveling up my social media videos with just a little bit of equipment and software. 1. Set up once. Record many. It will take a little time to set things up, so make the most of that time by shooting four or five of these at one time. This kind of “batch shooting” means you make the most of that good-hair-day and that your not playing with your lighting every time. I’m using a nice camera on a tripod at a relatively close distance. I want my head to fill most of the frame. I’m facing a window, so the lighting is all taken care of. I don’t have a fancy mic for the camera, so I’m using my cheap podcasting mic plugged into my computer via USB. I’m sitting back several feet from the mic and the wall so it won’t sound too echoey. ProTip! Pick a spot where you can leave the mic and tripod in place. This makes the process faster, making it easier to do this more often. Efficiency is one of your main goals. Lights… Camera… Turn your phone ringers off… Action! These are the seconds that are most likely to be seen in the social stream, so start with big energy, punchy statements and an extra bit of body language. Quickly go through the bullet list summary of the article. It should be five points or so with a few words about each. Just list the key points as if you’re telling someone about it in a voicemail message. Get a little excited about it. Use your hands. Don’t make it perfect. If you feel like you messed up, just pause, smile and do that part again. Stick the landing with a very brief sign off. It can be one simple word: thanks. That’s it! Now do two or three more before you get up. Since you recorded the sound on the laptop, the file in Camtasia is already open and ready to go. If you used a camera, plug the SD card into your laptop, copy the file onto your desktop, then drop in into the open Camtasia file. You want your head to be big and centered. Remember, it’s social media. On a desktop, it will appear in just a small part of the browser. On mobile, the entire screen is small. Let your face fill around 30% of the video. And scootch it up a little so there’s room for captions and the video player controls below your face. Syncing the audio and video should be very easy because you can see the waveform of the audio from the video file. Just line up the peaks and valleys. Captions are critical. In the social stream, the video will start playing without sound as they scroll toward it. Our goal is to slow them down and catch their attention. A silent, talking head doesn’t have a lot of stopping power. The text of the captions will draw them into the content. They’re also important for accessibility. Here’s a quick screencast of me doing the editing for one of these videos. This 4x speed so you can watch the entire 14-minute editing/captioning process in about four minutes. Save the file as an MP4 to your computer. Now it’s ready to be uploaded. The social network will show you basic engagement metrics (likes, comments, shares and views) but it won’t show you if visitors clicked (traffic) or what they did after they landed on your site (conversions). For this, you need campaign tracking code. 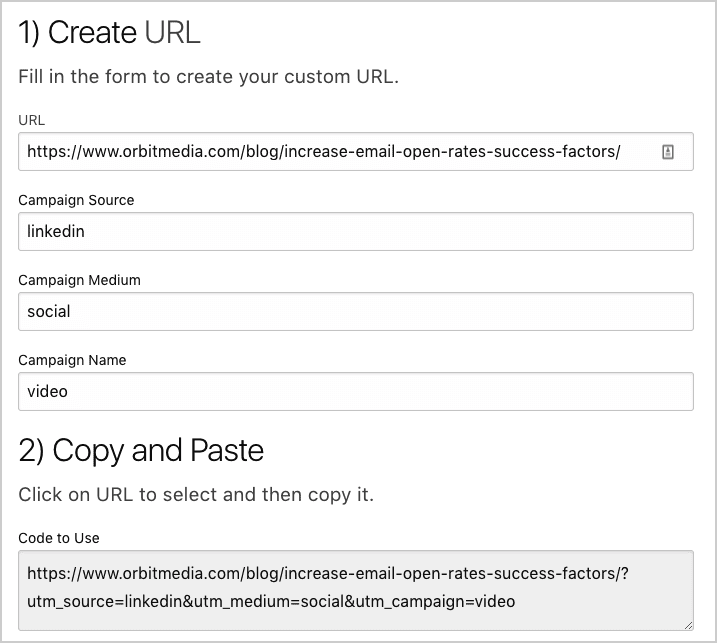 Use a simple URL builder to tracking codes (the medium, source and campaign name) to the link to your article. You’ll find simple instructions here. ProTip! Always use lowercase letters in campaign tracking codes. It matters in Analytics! You’re going to use that link with the tracking code in your social media post, allowing you to track the traffic and conversions in Analytics. 7. Make the social media post! Create a new social media post and import your video. Then, add the link with the tracking code. Next, you need to add the next and make the rest of the post use every trick in the social media book to catch the visitors attention. Mentions are a key ingredient in social media posts because they immediately make the visible to people who may share it. 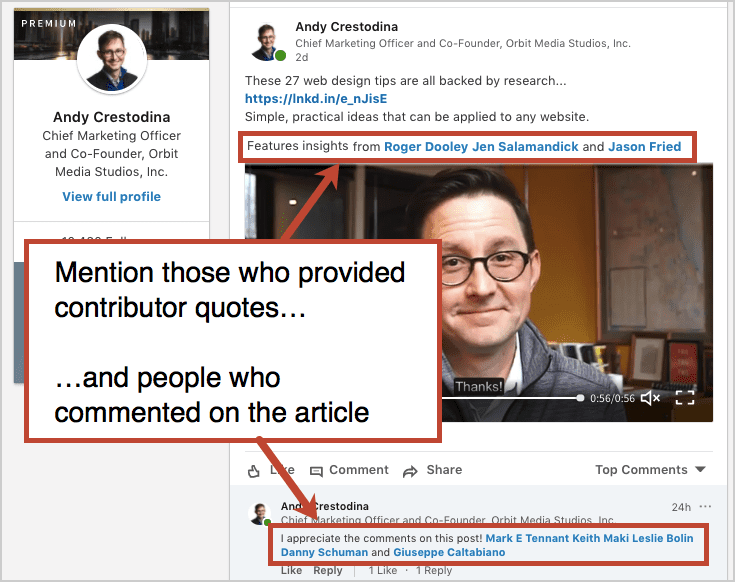 Adding contributor quotes to your articles (like this one) make your content better, make marketing more fun, and give you someone to mention in social media when the article goes live. I highly recommend any form of collaborative content marketing. ProTip! Post the social media video a few days after the article first goes live. That gives you the opportunity to thank (and mention) people who already commented or shared it. The video itself will do wonders for your click through rates, but the formatting and mentions are important too. If you need ideas, check out these social media post examples. Now that the post is live, it’s very helpful to jump-start the conversation by sending it to a few people right away. 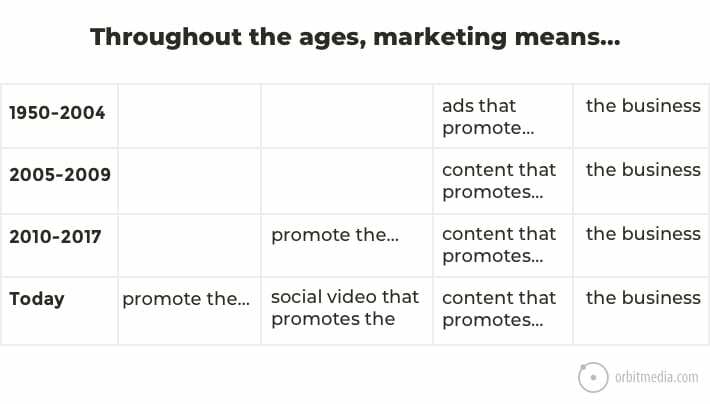 This helps trigger the algorithms that push the video to the top of the social streams. Take a minute to get the word out by sharing the link of the social media post itself. 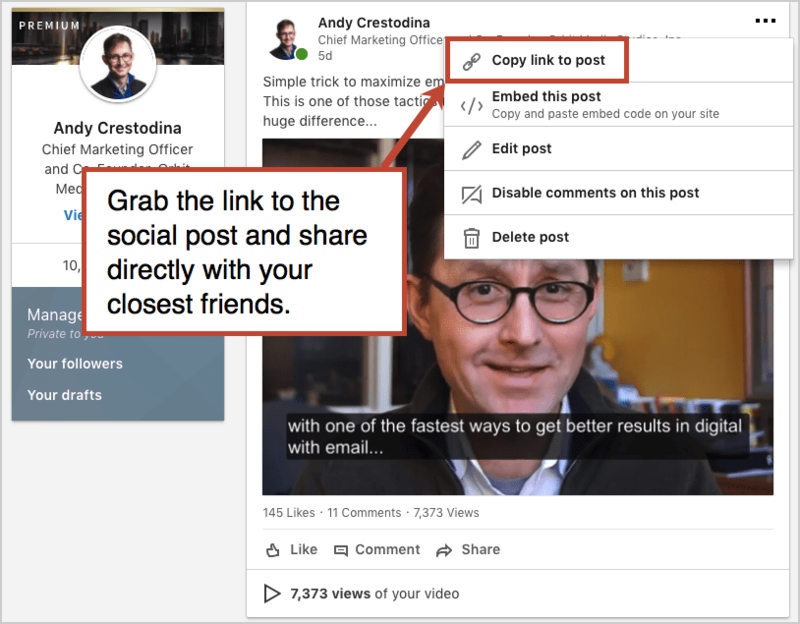 Here’s how to grab that link and send them directly to the social post. If they’re truly close friends, the request will be very short. If you really want to throw gas on the fire, there are tools that make it easy for your internal team to amplify any social post. Gaggle and LinkedIn Elevate are two of the biggies. Yes, I’m suggesting making commercials for articles. I’m suggesting sending emails to promote the videos that promote the content that promotes your business. It does sound crazy. It’s very indirect. Very meta. But it’s effective. It’s an excellent way to do marketing. Content is a great way to promote a business. Social video is a great way to promote content. And directly sharing the video with close friends is a great way to promote the social media video. The social network will show you the number of likes, comments, shares and views. But keep in mind that a “view” in social media is a video playing for just three seconds. They may have just slowed down a little bit as they scrolled past. Social metrics aren’t really what we’re looking for. The visits from the social post and video above went even higher after I took this screenshot. Visitors from more recent posts were lower, but still in the hundreds. The reach of the video is a function of the size of your network. Larger and more active followings will see greater reach and engagement from any social activity. Results vary. It might seem insane to spend 20 minutes on a single social media post. That’s like ten times the normal effort. But for us, the results were even greater. Still, it may not be realistic to put in this kind of effort for every single article. So focus on those articles that convert visitors into subscribers at the highest rate. 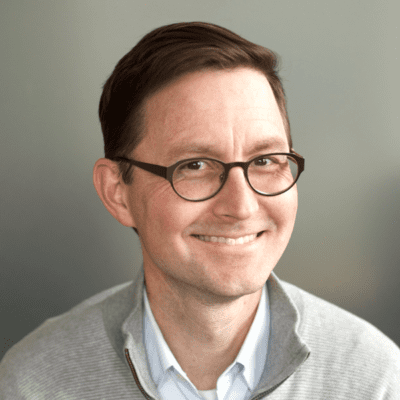 Before making a bunch of videos, do a content marketing audit and discover your best mousetraps. These are absolutely worth 10x the promotion. They’ll get you 100x the results for the effort. All the hard work is done. You now have an amazing little piece of social content you can use many times and in many places. Put that thumbnail in a future email newsletter. It will probably do wonders for your click through rate! Any other ideas for getting more value from a social video? Or ideas for making them easier to create? Please share your tips with your fellow readers in the comments. I love it Andy. You just opened a vault of content on my desktop – will try tonight, thank you. A slight dovetail – I’m in a really niche market (pet birds – 3.1% of American households) but still must go toe to toe with Amazon, Pets Mart ad nauseum. I’m doing video reviews of entire bird food lines. 1/2 way through my first as they have 30 unique skus/formulations. No one in the vertical is doing this. I now rank #3 for the manufacturer’s name and 8 of 10 slots on page one of “video”s are mine. • Captions would make a big difference! You are well on your way. It’s the beginning of a new era in social for us, Mitch! Great tip! I sometimes do that when I make a mistake. It’s easy to find that spot when you see the spike there in the waveform. Very actionable content and your step by step process can be followed easily. Thanks for the effort! Love this idea! I’m a writer, I love words and have been struggling with how to include video in my marketing mix. This is the perfect bridging idea. I don’t have to be telegenic and I don’t have to worry about being entertaining beyond a minute or two. Room echo is a big problem. Combat it with a mic reflection filter (Google it), which you can make (see YouTube) or buy for as little as $60. Many people like the Snowball USB mic that you can pick up for about $50. Great stuff Andy….but I do have a question. Is it better to post videos to one video platform (YouTube or Vimeo) then embed those videos in your posts? Or is it better to use the video functionality built into the various social sites? This is remarkably a great content and fascinating video tutorial. In fact, i will call it a complete guide. You did a great job, Andy, which is why i have already schedule this article for posting across social channels. Although i haven’t started video marketing, it is on my radar and I’m working on launching in the next few months. Videos are great in promoting content, especially when repurposing your best posts. And from the graph, you were able to generate leads and convert over 10 from from more than 500 visitors in 4 days. That is very interesting. Thank you, Clement! And thank you for including me in your recent article on Moss Media. Grateful! The social network will show you the number of likes, comments, shares and views. But keep in mind that a “view” in social media is a video playing for just three seconds. Awesome article Andy! Video marketing has helped brands and influencers to build credibility, something that consumers crave for. It was not possible to put faces to products and companies before such form of content was developed. Social media has made that possible. Andy I really enjoyed your article. I am a student at Benedictine University in Lisle Illinois. I wanted to choose this blog because I know that social media plays a large role in our society especially with regards to marketing. I have never been very technologically savvy, and I knew that posting videos about your products or articles is my better than just a posting. 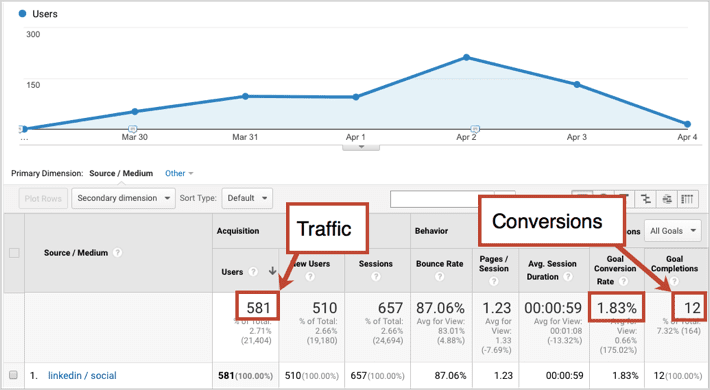 I was interested to find out just how much more traffic you will generate just by putting in a little bit of effort. 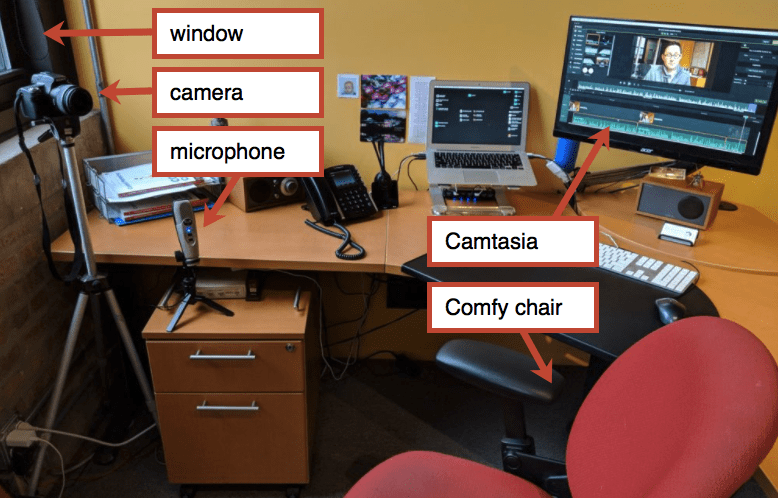 This article did a great job of walking me through the steps of setting up a video and not having to spend a lot of money. Is there a difference in the amount of traffic you will generate by setting up a Facebook video or setting up a YouTube video? Does one have an advantage over the other in your experience?